Abile – Twój biznes w nowej skali – Abile to firma consultingowa, oferująca kompleksowe rozwiązania biznesowe, umożliwiające efektywne zarządzanie przedsiębiorstwami oraz organizacjami sektora publicznego. We specialize in supplying IT systems (including ERP, Business Intelligence, BPM – Business Process Management) as well as providing consulting and integration services. 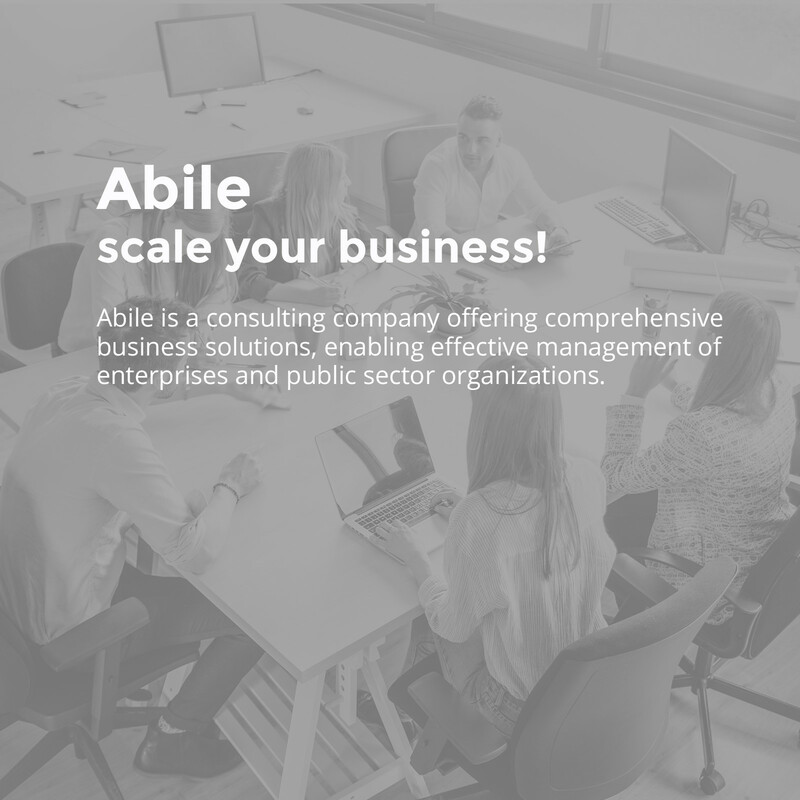 We help our customers to scale their businesses! We use only the best solutions, based on technologies from leading manufacturers, such as SAP, IBM or QLIK, adapting them to individual needs and scope of activity of the companies we support. With our experienced team of professionals, since 2007 we have been providing services at the highest level – starting from the analysis, through the process of implementation and project management, to service support and system maintenance. We cooperate with industry leaders, however, every company we support is important to us. This is why we provide solutions on time and in budget estimated. Our credibility is confirmed by the results of our work and recommendations from customers. We are one of a few consulting companies that are able to effectively implement solutions in the area of Planning and Budgeting. A unique, original methodology ensures that the expected business results are achieved. Our implementations are executed with the use of IBM (TM1) and SAP (SAP BO BPC, IBP, IP) solutions. We stand as a leader in the process of consolidation and preparation of capital groups' financial statements. Our consultants have participated in the most successful implementations in this field based on various SAP systems (FI-SL, EC-CS, SEM-BCS, SAP BPC) carried out in Poland. Our company approach the process of preparing and publishing reports comprehensively. We provide our Customers with a wide range of solutions: from individual statements to final reports (also in a form of XBLR), with the use of specialized tools for joint creation of statements and annual reports (Disclosure Management). We follow the needs of modern business, in which the necessity of quick decision making based on a huge amount of data and its dynamic changes becomes more and more important. We provide our Customers with an access to analytical tools of Business Intelligence class – QLIK for generating intuitive reports, presentations and conducting analyses in business areas crucial for the operation of the company. We have an extensive knowledge and know-how in the field of budget accounting and practical application of appropriate system tools for the needs of public institutions. Thanks to this, we are able to effectively implement projects for the Public Sector based on a dedicated SAP FM (Funds Management) system. Comprehensive business knowledge and experience in the implementation of advanced IT solutions allow us to efficiently lead our Customers through a complex process of implementing SAP ERP system (S4 HANA), without affecting current operation of companies. The success of the project depends not only on the understanding of implemented system, but also on the ability to manage IT solutions implementation, to understand the specific nature of the company and set measurable business goals. JobRouter® is an industry-independent digitization platform, comprehensively digitalizing and automatizing all business-related processes, data and documents. This includes, among others, the functionality of an outstanding process automation, intelligent receipt recognition, agile document management, efficient data management, and audit-proof archiving. With JobRouter® companies gain a scalable platform, leading them step-by-step or comprehensively to digital transformation: Through its strong own functionalities and flexible interfaces JobRouter® is seamlessly integrated in the existing system environment - further enhancing it simultaneously. From the very beginning of Abile's operation it was the Customer and his needs that have been the most important for us. Our activities are motivated by a system of values that helps us build joint successes based on the highest business standards. We cooperate with industry leaders, however, every company we support is important to us. All projects are carried out on the basis of a reliable analysis of the Clients' needs, the amount of investment expenditure and anticipated profits resulting from the implementation planned. We use the best system solutions, adapted to individual needs and business opportunities of the companies and institutions we support. In carrying out the tasks entrusted, we strive to act simultaneously as an advisor and business partner. We share our know-how and experience, working together to find optimal solutions. We do our work with particular care in order to fully achieve all of the business objectives. The effectiveness of our activities is ensured by, among others, our original methodology of e'PRIM implementations. We guarantee full transparency of the entire implementation process and readiness to answer any questions at any time. Our accountability is proven by results of our work and recommendation from satisfied Customers. Discover advantages for you company! Scale your business! Abile Spółka z ograniczoną odpowiedzialnością [Ltd.] with its registered office in Warsaw, ul. Chałubińskiego 8, 00-613 Warsaw, entered into the Central Register of Entrepreneurs by a District Court for the capital city of Warsaw in Warsaw, XIII Commercial Division of the National Court Register under KRS number 0000413734, Tax Identification Number (NIP): 9522044981 with a share capital 50.000 paid up in full.